NetherRealm Studios is revitalizing the Mortal Kombat series' original monstrous monarch for a whole new audience. 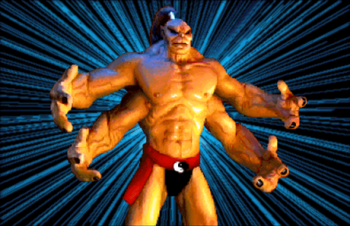 The Mortal Kombat games have always been stuffed to the gills with demons, ghosts and monsters, but few were as distinctive as Goro, the four-armed prince of the Shokan. Goro has made sporadic appearances in the MK games, but according to the latest issue of Game Infomer, the four-fisted monstrosity is a lock for the reboot. Goro made his debut in the very first Mortal Kombat game as the henchmen of the shape-shifting wizard Shang Tsung. Series co-creator Ed Boon said that Goro will be a boss character, and with Shao Kahn - who was Shang Tsung's boss, at least on paper - also confirmed for the game, it's likely that Goro will assume his usual role of sub-boss, with Kahn serving as the big bad. Both Goro and his underground lair/dungeon stage will return for the reboot, and both will be tweaked for a modern audience. Goro's stage is said to be dark and somewhat macabre, with bodies hanging from the ceiling. Goro himself seems largely unchanged, although it's unlikely that he will be a stop-motion puppet this time round. Also confirmed was the female warrior Jade, who first appeared as a hidden opponent in MK2. Like Goro, she's made a number of appearances in the Mortal Kombat games, starting out as just a palette swap of another character, but becoming a fully fledged character for MK3. For the reboot, NetherRealm has fused her costumes from Ultimate Mortal Kombat 3 and Mortal Kombat: Deception, giving her a new, but still familiar, look. Mortal Kombat comes out for Xbox 360 and PS3 in April.